After making a reservation online and explicitly putting in the notes section that we were out for a 55th and 30th birthday dinner for my mum and brother that everything had to be on point oh and also that i had a 3 year old with me so i would need a high chair. Well we got there and they did not have my reservation and when asked about a high chair they just shrugged it off and said we don't have one so we will have to make do with downstairs seating. It was dark. Dark to the point where we could not see our food properly and had to have one of the guys move the light closer to our table, then on top of all this the waitress did not even get our order right and my mother was waiting for her food while the rest waited and had there food go cold! The food was not very impressive either, bland no taste whatsoever for being a 'persian' restaurant. I would absolutely not recommend this place to anyone, extremely poor service and attitude. Food was absolutely over-priced and rubbish. Menu is designed only for tourists and non-Iranian who don't have any clue of authentic Iranian food. I lived in Iran for 20 years and never came across some food in your menu such as 'run away chicken'!!!!!!!!! I would appreciate it if you used Saffron in your food instead of that yellowish something!! Iranian cocktail???? Really? Since when? At least if you want to invent some cocktail under name of Persia, don't do it in such a pathetic way as you do! The combination of some cheap whisky and water with a half slice of not even fresh strawberry is definitely not an Iranian cocktail. The whole experience was an absolute rip off and I wish I could write a review on your web-site so I could save other curious costumers from such a horrible experience. Arrived at the restaurant for lunch as booked and it was closed! Saw staff sitting inside, who completely ignored us. Needless to say, I won't go back there in a hurry. Ate here with a big group of friends. Food was delicious - big portions and good value. Meals did arrive at different times, but would go back! It is a shame that this restaurant isn't a little bit cheaper, because then I would be wielding raptures. It is a great little find in a very over-commercialised part of the city: twinkling in candlelight, and with secret nooks and crannies (especially downstairs), it is a lovely place to find much-needed respite. I haven't been to a restaurant for a very long time with such sweetly attentive staff. At no point did their good service become obtrusive and they were always keen to give us advice on ordering dishes. I had never eaten Iranian food before and I found the dishes to generally be of a very high quality, although some were better than others. The halloumi and rocket starter was dazzlingly good, tingling on the tongue with different herbs and cooked juices. Falafel was light and airy, such a relief from the stodgy, over-processed balls you often get given. Hoummus was thick and delicious, although it was slightly too much lemon for our tastes. My main of Mizra was hearty and very good. The aubergines were mashed and garlicky and delicious with the olive salad, rice and yoghurt sauce. My friend's Tiger Prawns looked enormous and very good. My other friend wasn't so keen on her spinach and apricot stew. I had a bite myself and found it a little too sweet but nevertheless satisfying, in a gloopy sort of way. But dishes were of a very good size and all of us agreed that the variety of flavours was wonderful. Overall, I would definitely recommend this restaurant and imagine the atmosphere is very good on the bellydancing nights. For all that cheesiness, Simurgh still somehow manages to be elegant and relaxing. If you're looking for something different with high quality, both vegetarians and meat-eaters alike will find much to delight in and be surprised by. The food is Great and is served in an special way where you have a selection of diffrent types of cooked rice with the dinner. The I believe was the Late shah of Irans chef so you will get the Kings quality served in Simurgh. I've been there twice myself only asI don't live london. From what I seen The Proprietor also love playing Chess. One place to recommend. I have been in this lovely place with my fiance celebrating our union together. The restaurant provides you everything for a romantic evening, not much light, which is perfect for the atmosphere. I am a meat lover and I have been told that they make wonderfull grills, despite the stews. The location is also a very good point, less than a minute walking from Leicester Sq. underground. They usually ask you if is your first time, and kindly recomend couple of dishes. We had the mixed starters and the mixed grill, (IT IS JUST SUPERB), the marination of the meat makes it very juicy and tender, I was speachless. We had a great time, with everything included, starters, maincourse, deserts and of course the wine. That time was my first time, I can not count how many times I have been there anymore. The staff is smily and they give to you a special attention always.Considering that you are in Covent Garden and thequality of the food the price is very reasonable.I really recomend the place, not to mension the beautiful belly dancer, and guess, she invites you to dance with her after performing beautifuly. I have no complains about the place, I even had my birthday party there, we where about 22 people, everything was on time, and by the way the cocktails are very unique and tasty. If you want to have a really great time with your friends GO TO SIMURGH!!! The food was ok, not exceptional. Very disappointed with the chicken. Priced fairly though. Is service improving on the lunchtime slot? That would be great!! Food great! As usual, slow service but good food! I should have booked for 30 mins earlier, because the service was slow starting. Once the staff "got it together" though, we enjoyed the meal thoroughly. The food was delicious, well-presented and reasonably priced. You need to book for a Saturday night- a lot of people were turned away while we were there. What an absolute gem! 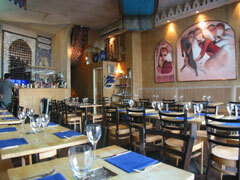 Lovely little restaurant, conveniently located near Covent Garden and Leicester square. Oozing charm and atmosphere. Incredibly friendly and helpful staff and the food! Amongst many memorable dishes (there were 7 of us)the Duck and Walnut stew really stood out. The best I have ever eaten - and I have Iranian friends who are excellent cooks! Also noteworthy were the Gulf Prawns - huge and succulent - and the Chicken and Banana stew - like a gorgeous savoury banoffie pie!! Each dish was complimented by a wonderful rice dish and a gorgeous tasting salad. We are still drooling over the Lazy Pumpkin desert! Highly recommended - I am definately going back!! Terrible...and they refused to offer the set menu that was advertised - never coming back! a bit empty but food was great! Lovely resturant with fantastic food. The staff helpful and attentive. Can't recommend this place highly enough! Me once again, tasty food, good service! I can;t get enough of this palce...really great! Fantastic food, good service...great value! Very good food as usual - great value!!! Food was tasty and made me want to go back again - Very good value too! Service is attentive and kind, but food takes too long to reach the table, even when the restaurant was empty! The belly dancing is amazing!!! the food delicous and the atmospher buzzing and friendly! I Loved it and we'll be coming here again!